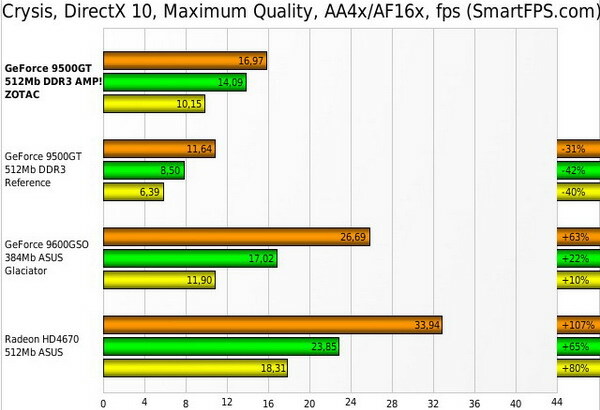 Every generation of video card gets its low-end. 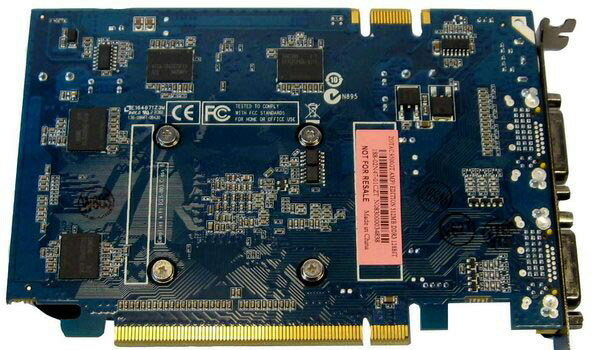 When ATI released their first part entry-level, part mainstream 4000-series cards, the HD 4600s, they painted a picture of creating cheap cards that could actually play current games. But then they followed it up with the 4550, and things went back to normal. 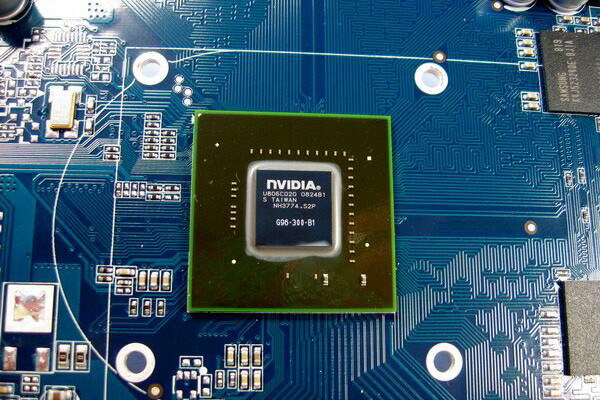 NVIDIA, faced with the same conditions, went and decidedly did the same thing. 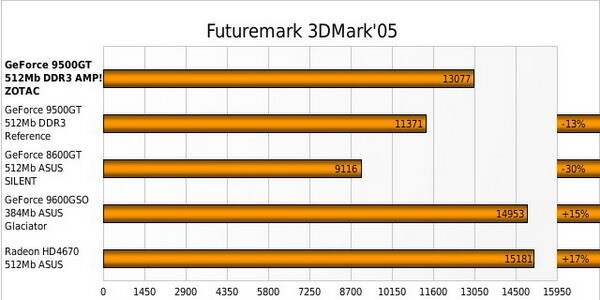 On paper and in tests, the 9500 GT is half a 9600 GT–there’s a lot missing in that last 100. It’s got half the shaders (32) half the ROPs (8) and half the bandwidth (128-bit). 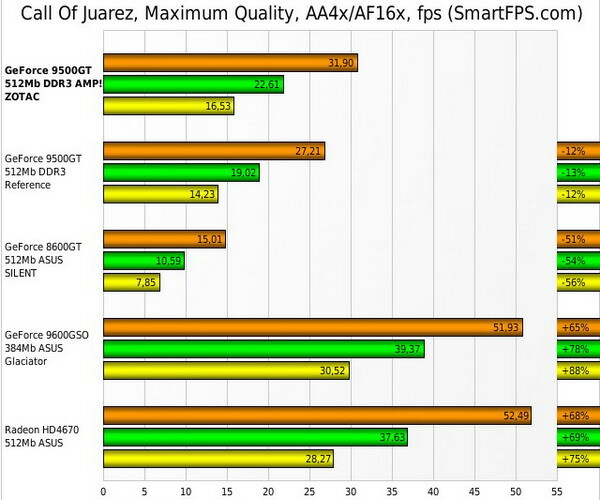 Adding insult to injury, everything is clocked lower; GPU, memory, even the shaders are slower. It’s more like two-fifths a 9600. Why am I telling you this? Because I don’t want you to buy a 9500 GT. 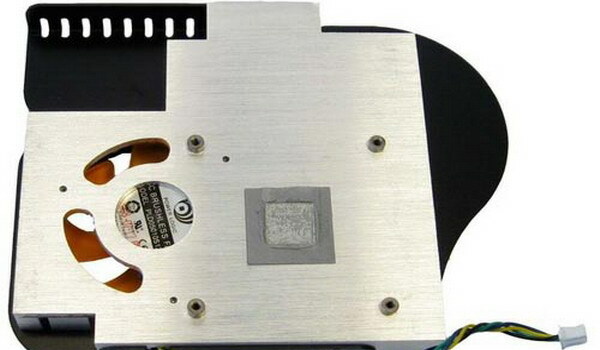 Seriously, don’t buy it or even an ATI card for the same price. Even at minimum wage, you’re minutes away from being able to buy a 9600 GT, and if you don’t care about games you’re plenty covered by integrated video. Maybe that’s not completely fair. The card is, in fact, capable of playing games, at low-ish resolutions, without much or any anti-aliasing… If you in a position where you were happy with your 7600 or 8600, or for that matter, 1600, and have to get a replacement toot sweet, then sure. Get this, you’ll be happy. Everyone else, you might as well keep these results in mind when you want to convince someone to get a better card. This little card is simple and clean. It’s got a smaller heatsink and no auxiliary power connections. 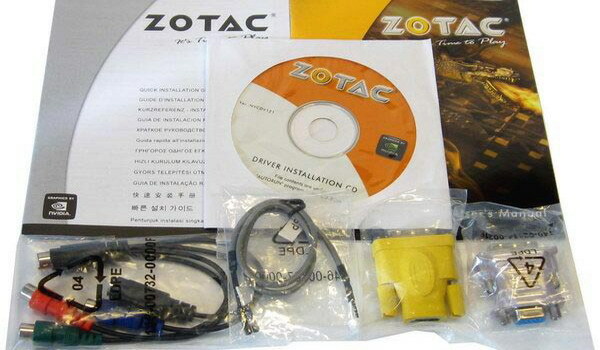 It’s got two DVI connectors and comes with a VGA adapter, a video break-out cable, some thin documentation and a driver CD. 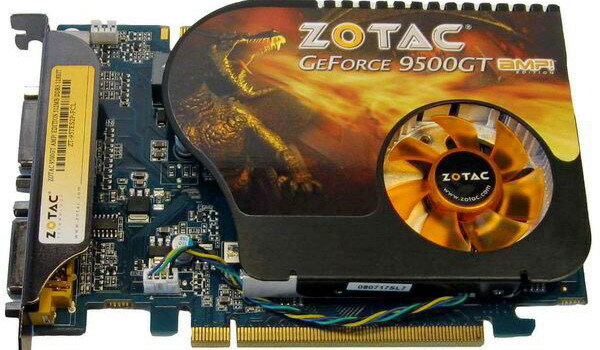 Oddly enough, the card I have doesn’t have the same specifications of the 9500 GT Zone listed on the Zotac website. 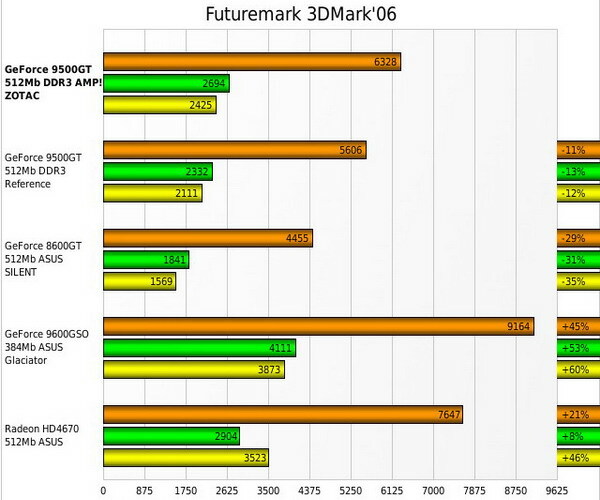 Mine reports a 50MHz GPU frequency bump, up to 600MHz. 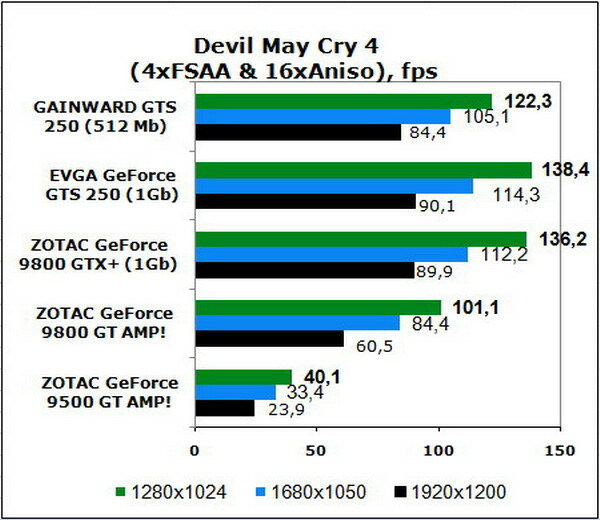 The card also has 512 MB of GDDR3 memory clocked at 1600MHz, a 1350 MHz shader clock speed and supports resolutions up to 2560 x 1600. 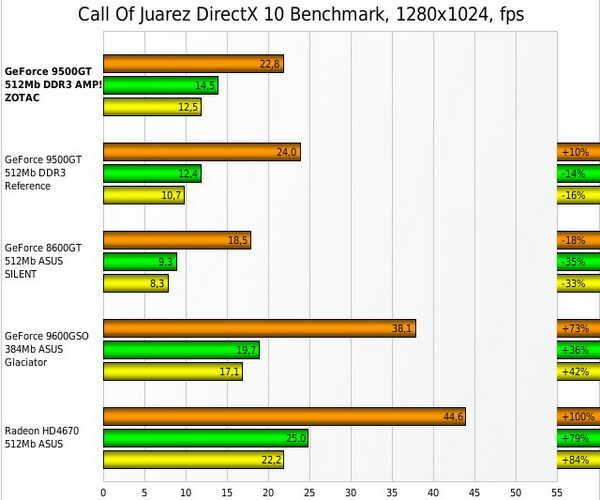 It supports Direct X 10 and OpenGL 2.0. 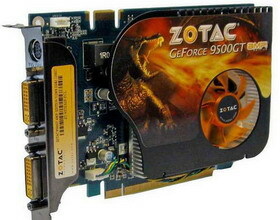 A ZOTAC GeForce 9800 GT AMP! 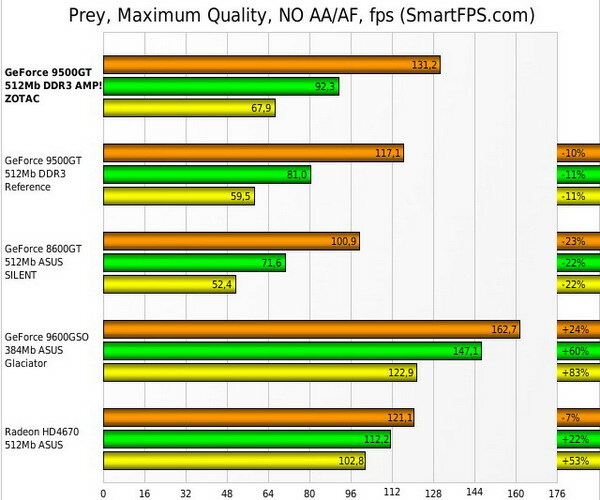 The only game here that the 9500 GT performs reasonably with is Unreal Tournament 3. 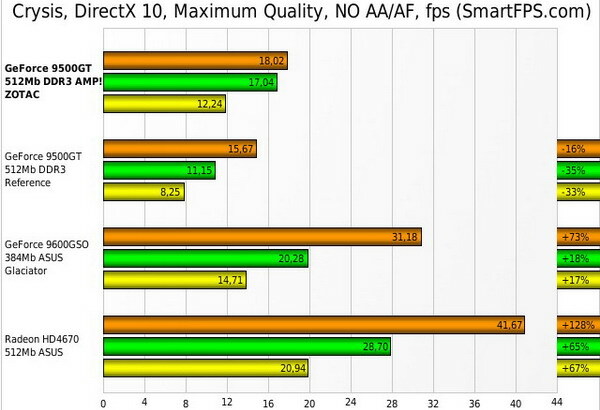 You could probably play other mainstream DirectX 10 titles with the graphics turned down, but scratch Crysis off the list. 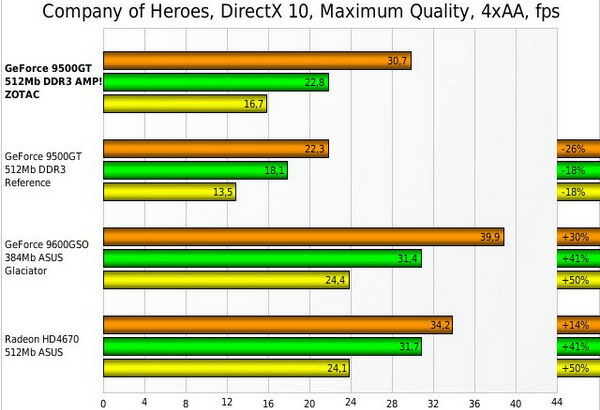 DirectX 9 games are all alright, but even older games aren’t going to play well with their graphics turned up, and the synthetic scores were topped back. This card is good at video playback, which is definitely an improvement over previous generations of hardware, but it’s still not a hundred percent. 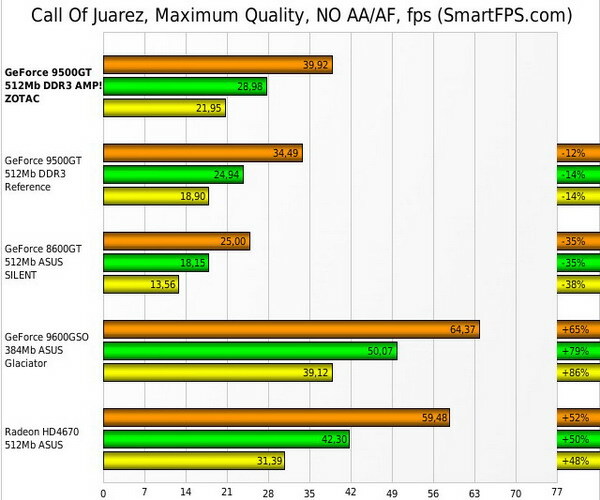 I wouldn’t put this in an HTPC, since, why, even integrated graphics can be expected to do this well or better with video. I guess this is a win. Yes, this card draws an amount of power that would have a hard time charging a light bulb. 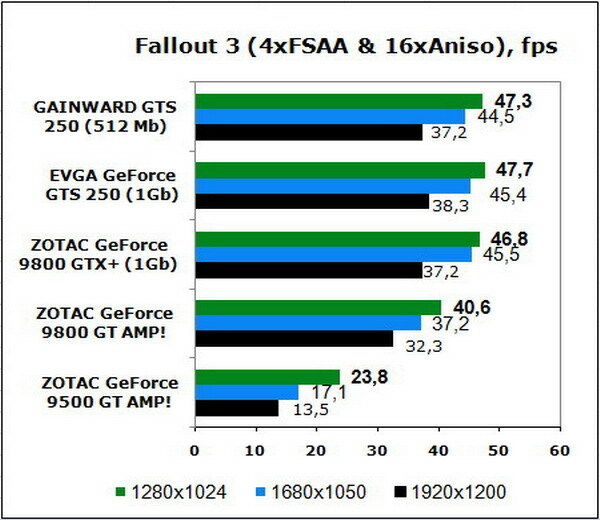 But again, I’m going to play the integrated graphics card, and point out that this power draw is infinitely greater than no additional power. At the very least, this card is quiet. Even while loaded it’s very cool and makes practically no noise. It’s hard drive quiet. 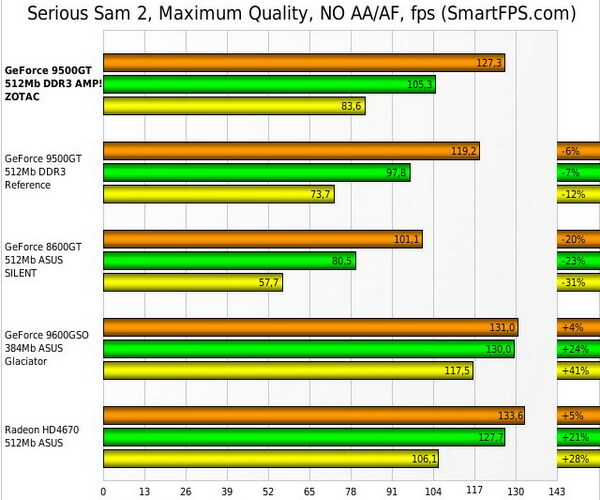 At a first glance, overclocking is, I suppose, impressive. 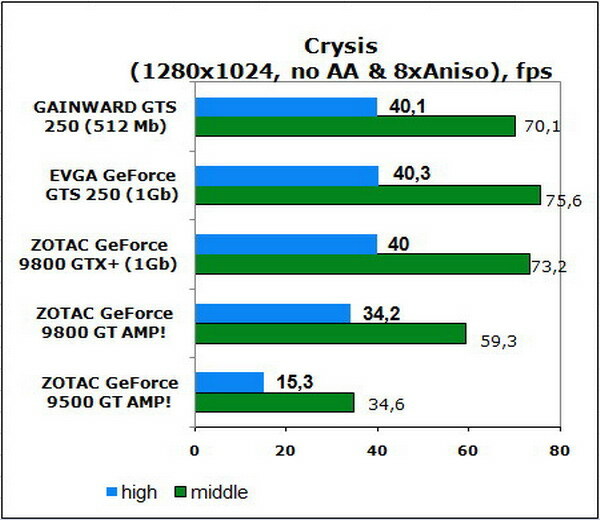 Something tells me that the buyer of this card is not going to overclock it. 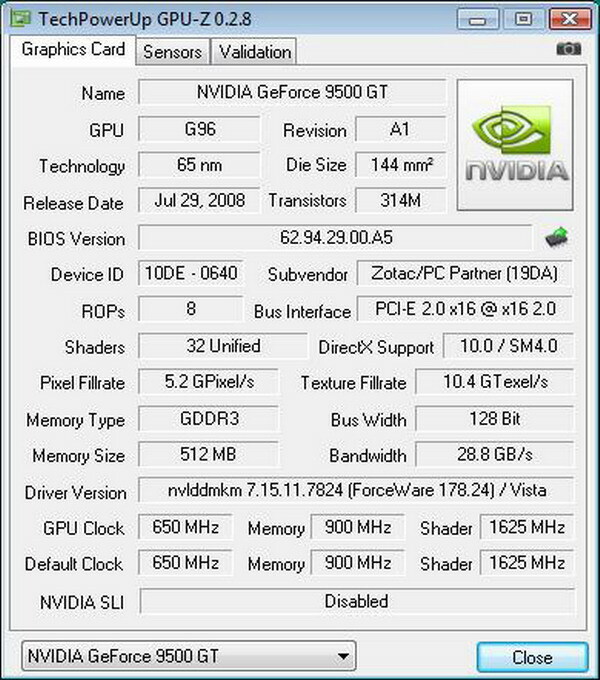 One funny thing is that the website lists this card as having a core speed of 550MHz, where this card plainly has a 600MHz GPU. It hit 650 when I overclocked it. 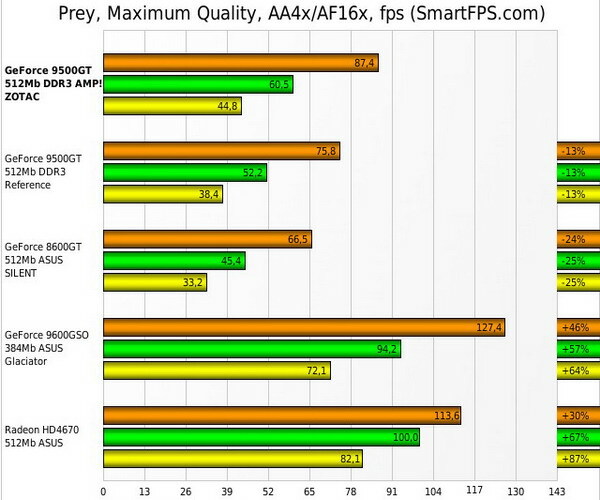 We’re at a point in desktop computing where even integrated graphics aren’t terrible at Source games, and games like World of Warcraft aren’t unplayable at all. 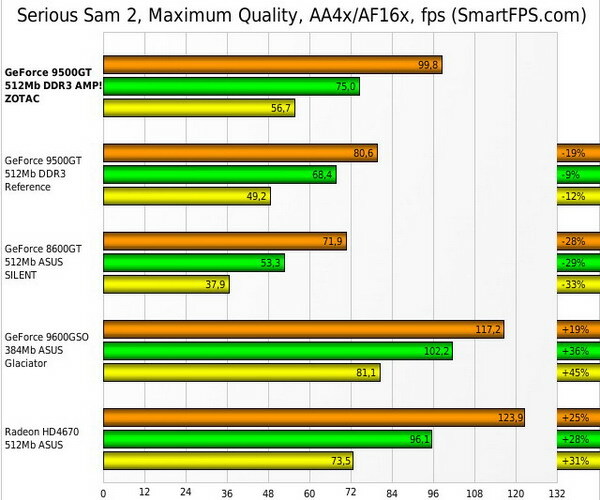 On that front, this card is a step up, but for only a little more you can get much better hardware. So in an effort to give purpose to this card’s existence, I can say this: if you’re the purveyor of an Internet cafe, a digital barista, and you have to build twenty computers capable of running WoW: Wrath of the Lich King, then this isn’t a bad way of saving a grand or so. Of course, the guy who decides to go the (metaphorically short) mile and get twenty 9600 GTs is going to steal all your business, even if his carpet smells like feet and all his clerks live in the halfway house across the street. 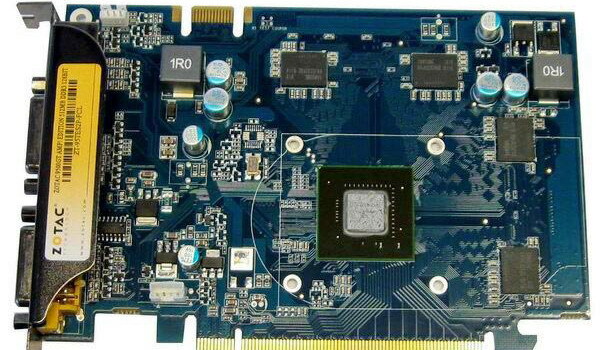 Ironically, if this card was capable of HybridSLI then it might have a greater value, but the feature is limited to video cards that don’t benefit from the technology. 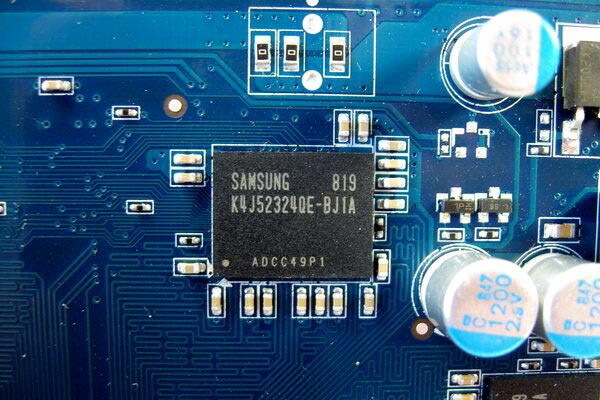 But then, if you’ve got a HybridSLI-capable motherboard, then you already have onboard video. 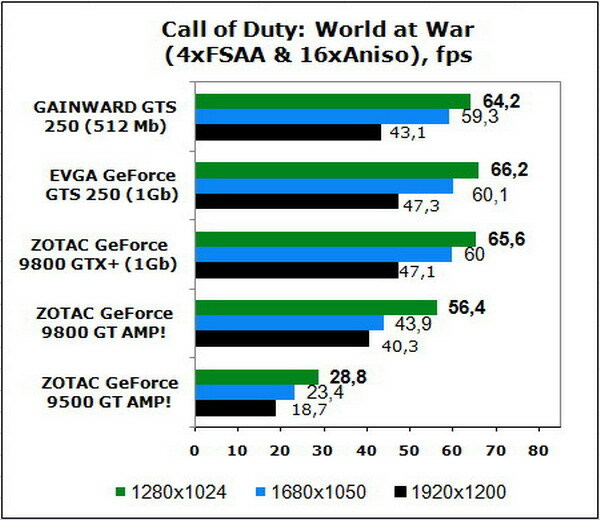 Stick with it or get a, er, real gaming card. 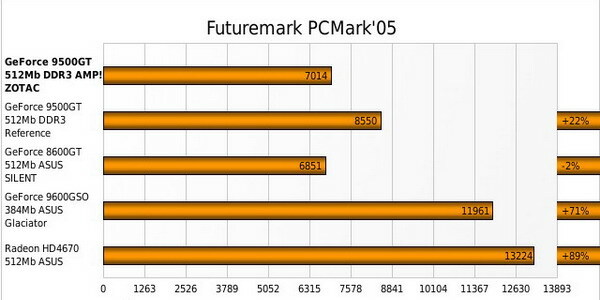 But it’s worth saying that a 9500 GT is better than no graphics whatsoever, and it’s true that people can spot that difference. This card is for the person whose discrimination doesn’t exceed the ability to tell the difference between Yahoo! Mail and a blank screen. 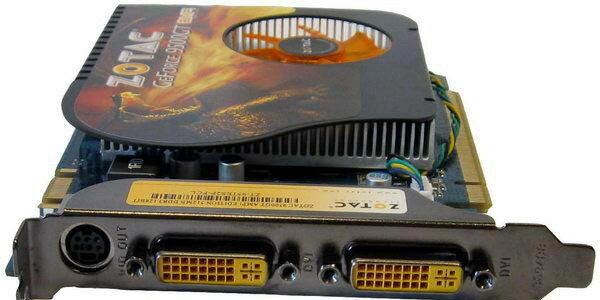 If you just need any old video card, well, this one’s for sale.